A federal oversight panel criticized the Obama administration's attempts to boost small business lending, expressing doubts on everything from the plan's promised success to whether the administration is taking the right approach. The administration has proposed a host of programs fuel small business loans, which have nosedived over the last 20 months. However, the bulk of the money is centered on a TARP-like program that would invest up to $30 billion in taxpayer money into banks. The cost of the funds would decrease as banks increase their lending to small businesses. "[S]mall business credit remains severely constricted," according to the Thursday report issued by the Congressional Oversight Panel, the bailout watchdog. Lending "plummeted during the 2008 financial crisis and remained sharply restricted throughout 2009." With Wall Street banks cutting lending and smaller banks "strained by their exposure to commercial real estate and other liabilities," many small businesses "have had to shut their doors, and some of the survivors are still struggling to find adequate financing." "Small businesses have long been an engine of economic growth and job creation in America," the report states. "More than 99 percent of American businesses employ 500 or fewer employees, and together these companies employ half of the private workforce and create two out of every three new jobs. If the Troubled Asset Relief Program (TARP) is to meet its Congressional mandate to promote growth and create jobs, then it clearly must address the needs of small businesses. "If credit is unavailable, small businesses may be unable to meet current business demands or to take advantage of opportunities for growth, potentially choking off any incipient economic recovery," the report states. But the administration's approach may be based on a flawed diagnosis of the program, the report notes.There are open questions as to whether the reason for the decline in credit available to small businesses is due to demand or supply, according to the report. There is less demand for loans, the report states, and the creditworthiness of borrowers also has declined -- a consequence of the worst economic downturn since the Great Depression. "[O]ur community banks [that have sufficient capital] clearly want to lend, but the demand is not there from the creditworthy borrowers," Stan Ivie, the San Francisco regional director of the Federal Deposit Insurance Corporation, told the Panel last month. "It seems like the healthy borrowers who could borrow are not interested in borrowing at this time." There's also a lack of supply. Banks, predictably, are more risk-averse, chastened by losses on loans stemming from years of lax underwriting and the toll of the recession. Lending slid as banks sought to rebuild their depleted capital levels. 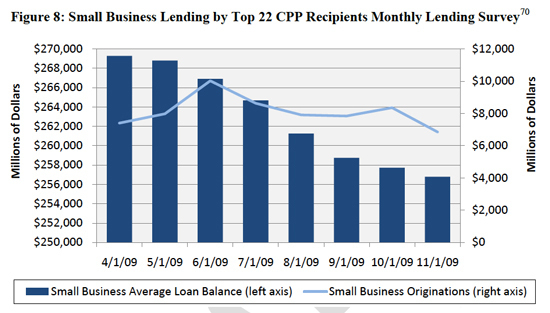 Small businesses receive more than 90 percent of their funding from banks, according to the Panel's report. Despite the supply-or-demand debate, the administration is intent on providing a supply-based solution, the report notes. "TARP had focused in its early months on bailing out Wall Street," the Panel's chair Elizabeth Warren said during a Wednesday evening conference call with reporters. Late last year the Treasury Department announced a change. "And now [Treasury Secretary Timothy Geithner] said it was time to focus on Main Street. Now that Treasury has made small business a priority, how well is it doing?" she asked rhetorically. "The results are not encouraging," Warren answered. "The largest TARP program, the Capital Purchase Program (CPP), provided hundreds of billions of dollars in new capital to banks, but Treasury did not require recipients to use the money to improve credit access. In fact, after receiving the money, most recipients decreased their lending." 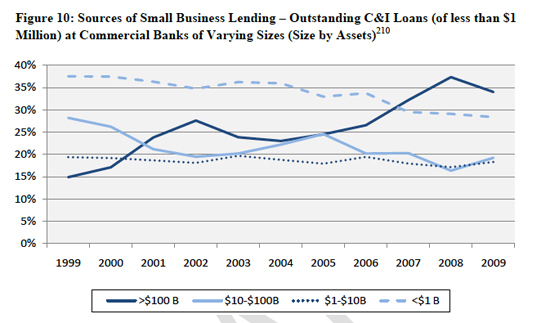 "The Term Asset-Backed Securities Loan Facility helped to restore liquidity to the securitized lending market, but because relatively few small business loans are securitized, the program had little impact on small business lending." "[T]he Public-Private Investment Partnership program remains in its early stages, it has not targeted and will likely not target the smaller financial institutions that often serve small businesses." "Two programs, the Community Development Capital Initiative (CDCI) and the Small Business Administration Securities Purchase Program, are proceeding under Treasury‟s existing TARP authority, but their effects are likely to be limited. The CDCI will serve only a limited number of very small institutions, while the Securities Purchase Program would affect only loans guaranteed by the Small Business Administration, which make up a small percentage of the small business lending market." And the proposed $30 billion fund, which first needs the approval of Congress, "may not be fully operational for some time. It could arrive too late to contribute meaningfully to economic recovery," the report notes. "Moreover, banks may shun the program for fear of being stigmatized by its association with the TARP, or they may wish to avoid taking on...liabilities at a time when their existing assets, such as commercial real estate, remain in jeopardy." Also, the Panel states, the fund "raises questions about whether, in light of [TARP's] poor performance in improving credit access, any capital infusion program can successfully jump-start small business lending. "Supply-side solutions that rely on bank balance sheets...may not increase lending," the report notes. The Treasury Department counters that the fund forms a key component in its arsenal of programs to increase the flow of credit and create jobs. Jobs can't be created without increasing credit. Treasury notes that the fund focuses on smaller banks because they nearly maintained pre-crisis lending levels, in comparison to their much-larger competitors. "[O]ur proposal focuses on the lenders that did the most to maintain lending to small businesses during the crisis," Gene Sperling, a top adviser to Geithner, wrote in an e-mailed statement. The fund "is targeted only to smaller and community banks, with incentives targeted only to those that are increasing their lending to the small businesses our economy needs to expand and create jobs." "The [$30 billion fund] will help prevent viable community banks that are worried about their commercial real estate portfolios from responding by cutting back on lending to the small businesses we need to support job creation and a strong recovery," Sperling wrote. He added that the program, "created completely outside of and separate from TARP," will help community banks "feel more comfortable" participating in the program. The Independent Community Bankers of America, community banks' main lobby, supported the proposal when it was announced. Finally, Sperling added that the fund is one part of its overall response, noting that the administration is also proposing "small business tax relief, expansions of SBA programs and new lending initiatives." The oversight panel, knowing the administration's response, was unmoved. "Because small businesses play such a critical role in the American economy, there is little doubt that they must be a part of any sustainable recovery," it noted in its report. "It remains unclear, however, whether Treasury's programs can or will play a major role in putting small businesses on the path to growth."